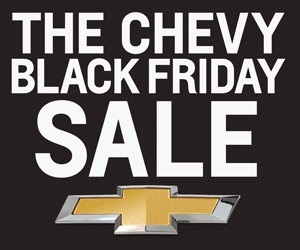 Uftring Auto Blog: The Chevy Black Friday Sale! The Chevy Black Friday Sale! Just announced! It's the Chevrolet Black Friday Event at Uftring Weston Chevy Cadillac and Uftring Chevrolet in Washington. Back by popular demand – the price you see is the price you pay on new 2013 and 2014 Chevrolet Cruze, Malibu, Equinox and Traverse. You'll be able to take advantage of the low GM Supplier Price on these models, plus an extra $500 Bonus Cash through December 2, 2013! Choose from a HUGE selection of new Chevrolets – including remaining 2013 models and get our lowest prices of the year! Uftring Weston Chevy Cadillac in Peoria and Uftring Chevrolet in Washington want to be your Black Friday Savings Headquarters. We have the people you know and trust, the inventory you're looking for – and now an even better reason to buy! Don't worry about saving a few bucks on a television or sofa – save thousands on a new Chevrolet! These are limited time offers to car buyers in Peoria, Washington, East Peoria, Morton and surrounding communities in Central Illinois. See stores for complete Chevy Black Friday Sales Event details through December 2, 2013.